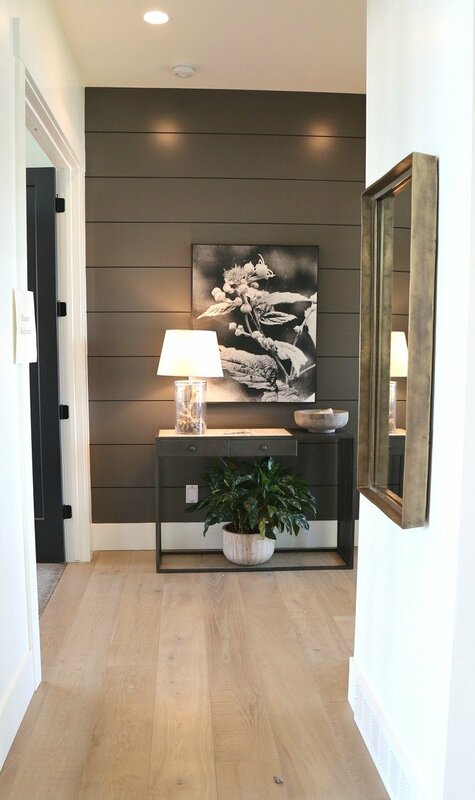 I’m really excited about today’s post because I just returned from Salt Lake City and while I was there, I did the Salt Lake City Parade of Homes. I can’t wait to share all the beautiful homes, design ideas and trends with you guys that I picked up from my time there. So, just to give you quick background, Salt Lake City is one of the fastest growing cities in the country right now. In fact, both Salt Lake and nearby Provo are both in the top 10 of Forbes fastest growing city list for 2017. 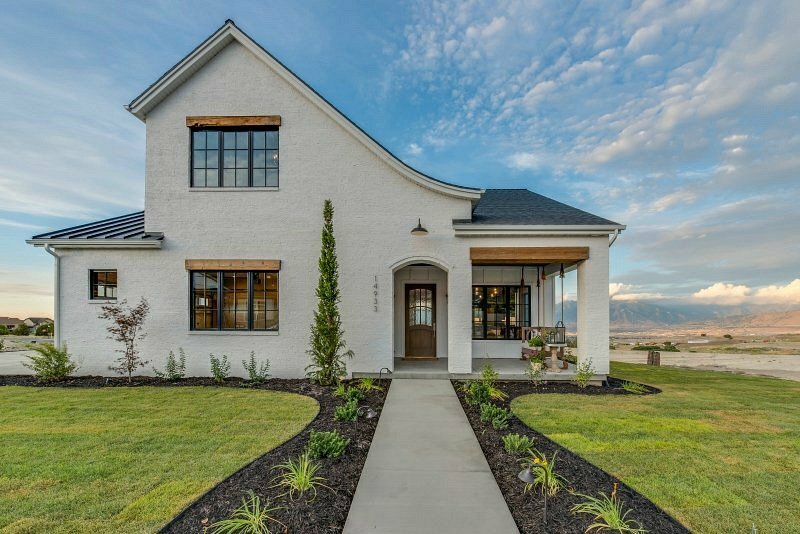 There is such a massive new home building boom going on in that region and for that reason, I decided to go to Salt Lake to look at new homes, see the latest building/design trends, talk to builders and do the Parade of Homes tour. 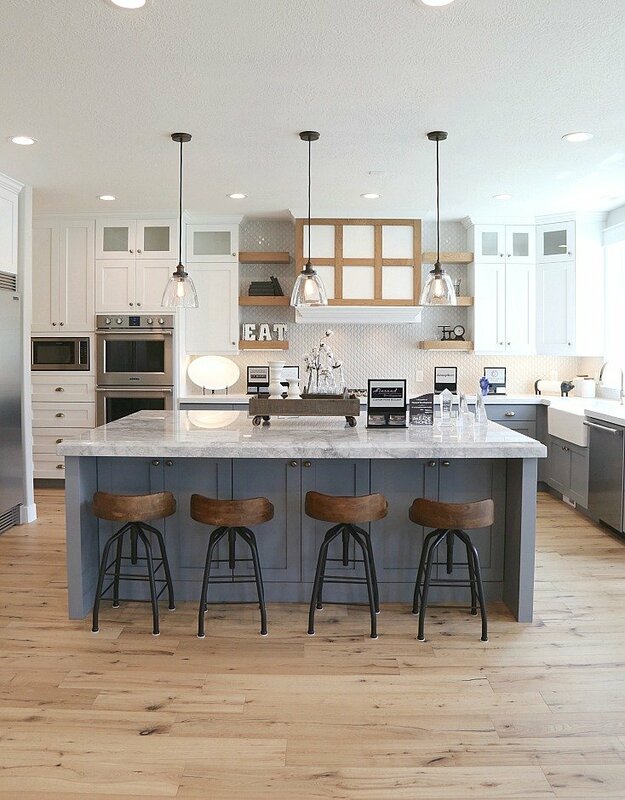 Today’s post is really just some of the highlights and over the next few weeks/months, I will share more whole home features, in depth trend posts and highlight some amazing Salt Lake builders/designers that I met and visited with. By the way, if you live in the Salt Lake area, you gotta go see the tour! It’s so amazing and it’s is still going on until August 12th. What was really interesting about the home tours is that all of the exteriors were each so different from each other, which is a rarity. Out of the 33 homes on the tour, I was so surprised that no two home exteriors that I saw (I toured about 25) were alike. I can say the same for the interiors as well. 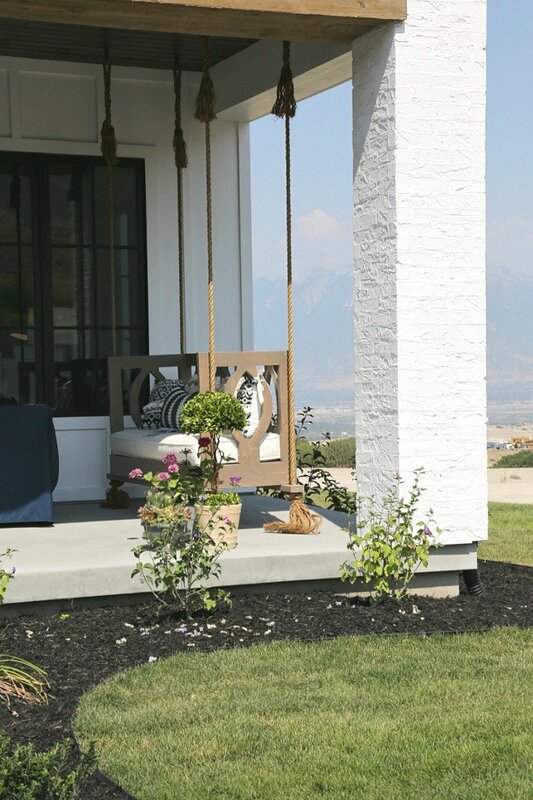 Home #24 called “Farmhouse Charm” by Park Capital Homes was one of my favorite exteriors. The exterior of this home took my breath away when I drove up. 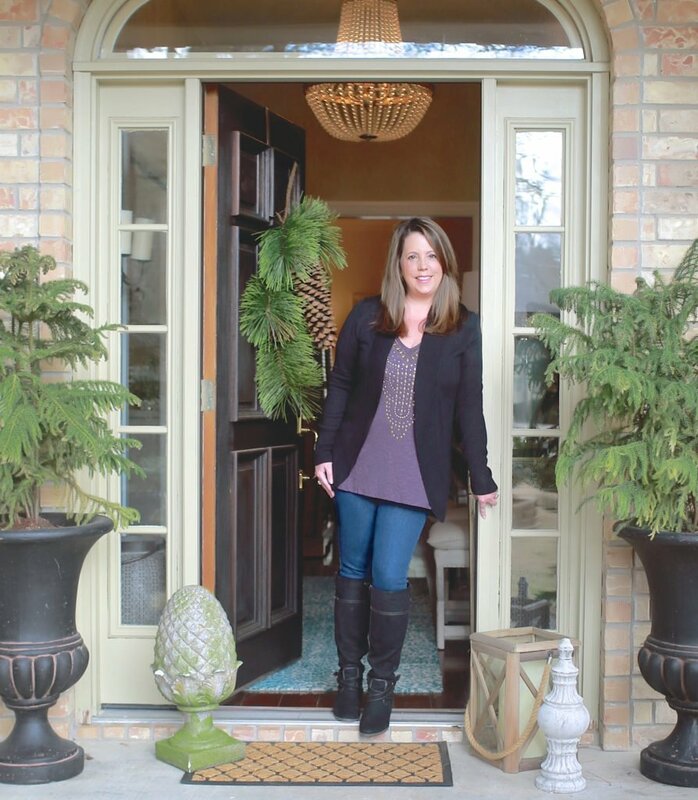 When I walked up to the home, I immediately noticed all the little details like the painted white brick that was mixed with the white beautiful trim work pattern. Such a smart idea! Notice they did it on the columns too! While most of this home was white, the light fixtures, front door, garage window trims and gutters were black. A beautiful combination! 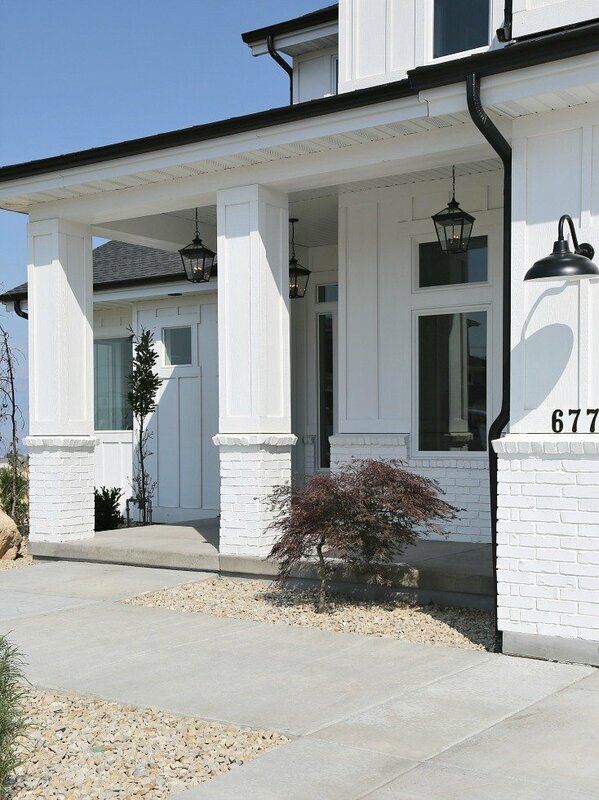 Home #23 by Magleby Communities was another favorite exterior that I loved on the tour. 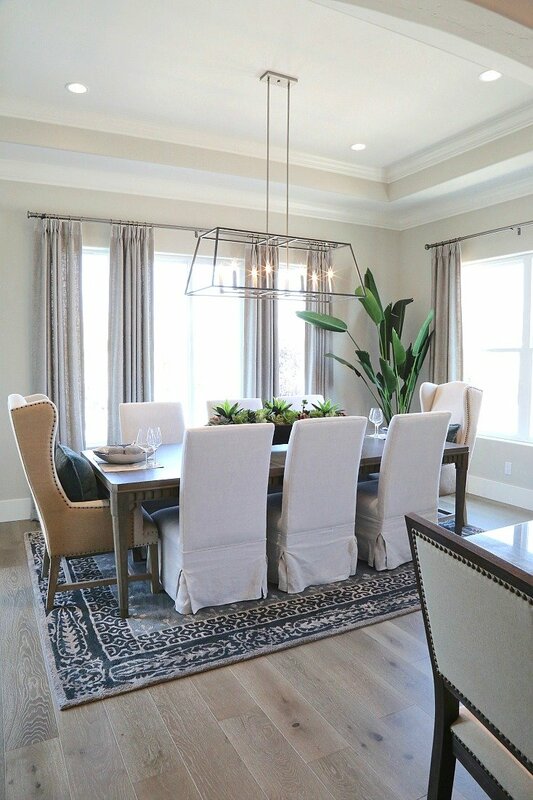 I’m sharing an image of the home from their website because the image shows the home so much better than the pics I took. Notice the incredible mountain view on the right side of the home! The Magleby Communities home was so beautiful and interesting to me. The exterior and interiors are so beautifully done and a lot of very interesting design elements that I had never seen before. Notice the wood trim pieces over the windows and porch. Also, at first glance, this home looks stucco but it’s actually brick with an off white “German Smear” type technique. If you look closely at the column below, you can better see the cool paint technique. 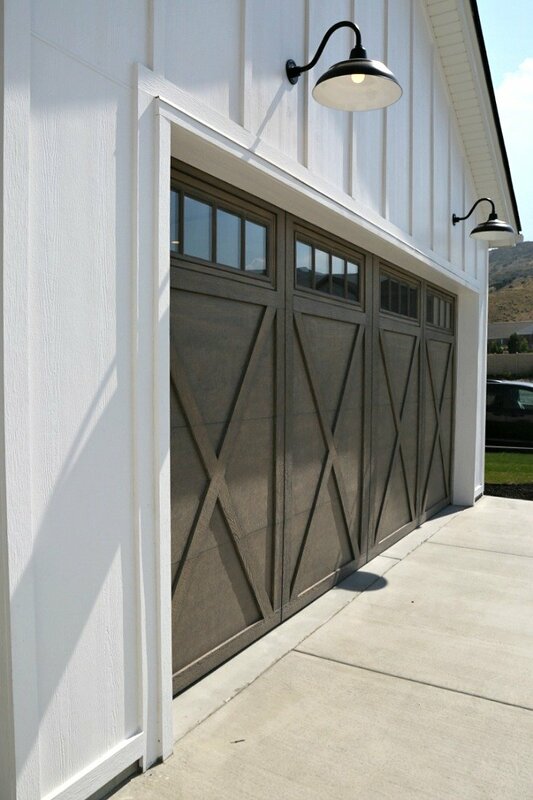 The exterior garage doors on this home are amazing! 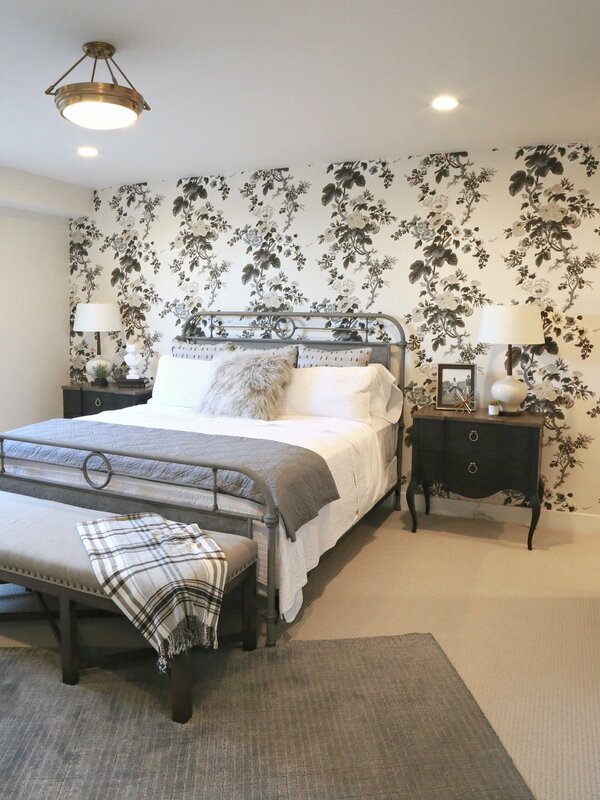 My jaw hit the floor when I saw this beautiful bedroom and wallpaper accent wall in the Magleby home. It’s absolutely stunning! 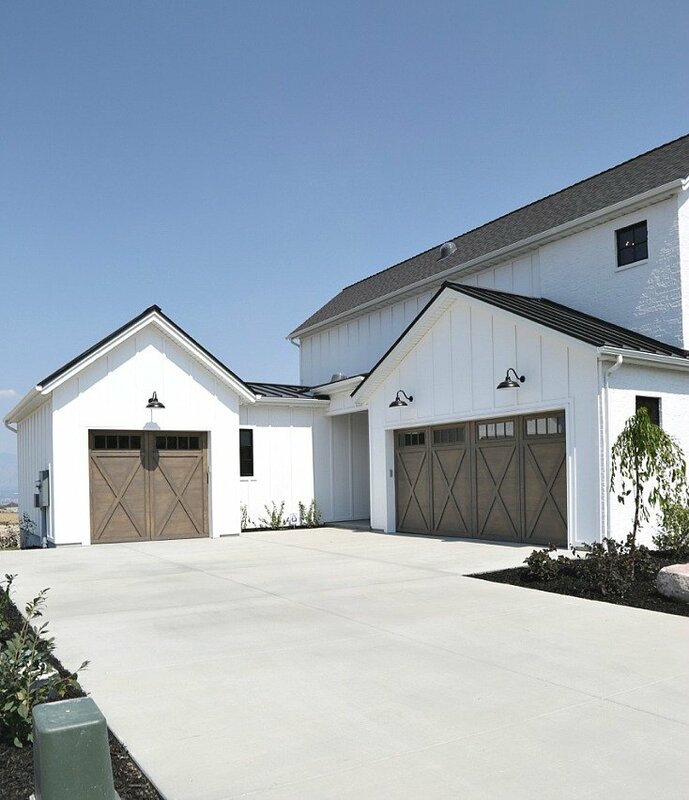 What was even more interesting about this home is that it was a new Magleby construction community in the Herriman area that is built up the foothill of a mountain with incredible mountain views across the city. If you live in the Salt Lake area, go visit this project because it really is beautiful what they are doing there! 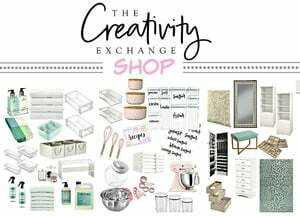 I can’t wait to highlight more of this home in the next few weeks! 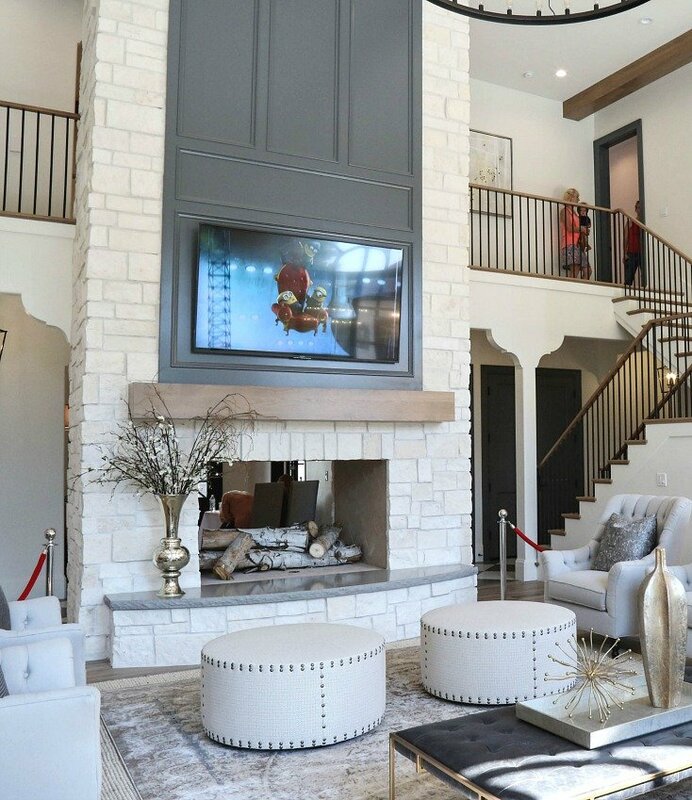 It’s really hard to choose a favorite home on the tour because honestly, they were all pretty spectacular to me. I knew they would all be so amazing, which is why I traveled all the way from Texas to Salt Lake. However, I can say that I fell madly in love with both the exterior and interior of home #7 called the “Bedford” by Silverhawk Enterprises. 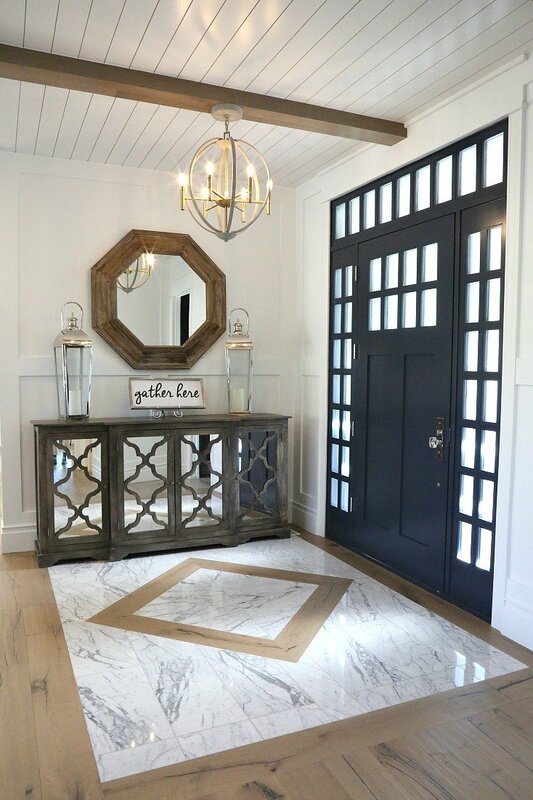 From the walk-up, to the entry, to every corner of this home, my jaw was pretty much dragging on the ground and I’m pretty sure I was drooling all the way through. 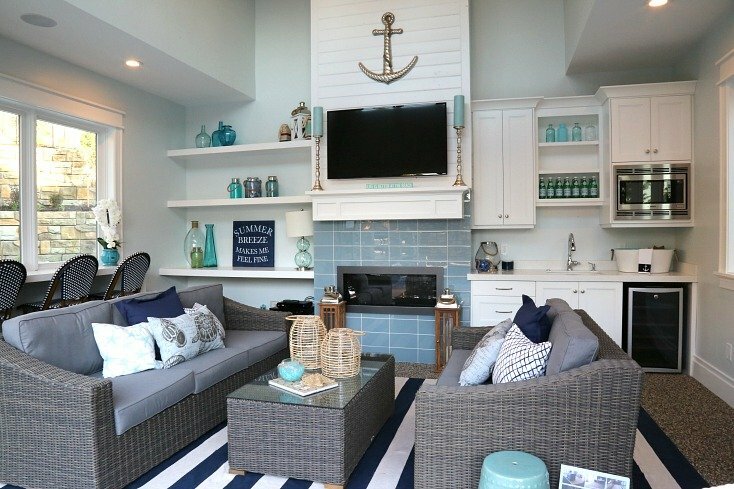 So many creative elements and details in this home that I have never seen before. I spent so much time in this home and taking pictures that the builder Tom Hasleton came over to talk to me. It was such a joy to visit with the person who built this stunning home and learn more about the project. In fact, Tom told me that his wife Heidi Ann Design did all the interior design, which was so amazing! Here’s a few more shots from the Silverhawk gorgeous home. This is just a snippet of the amazingness of the Silverhawk and I can’t wait to highlight more of all the beautiful spaces and hopefully Tom and Heidi will answer some questions that I’m sending their way that I can share with you guys! I saw so many beautiful kitchen designs and so many elements I have never seen before. 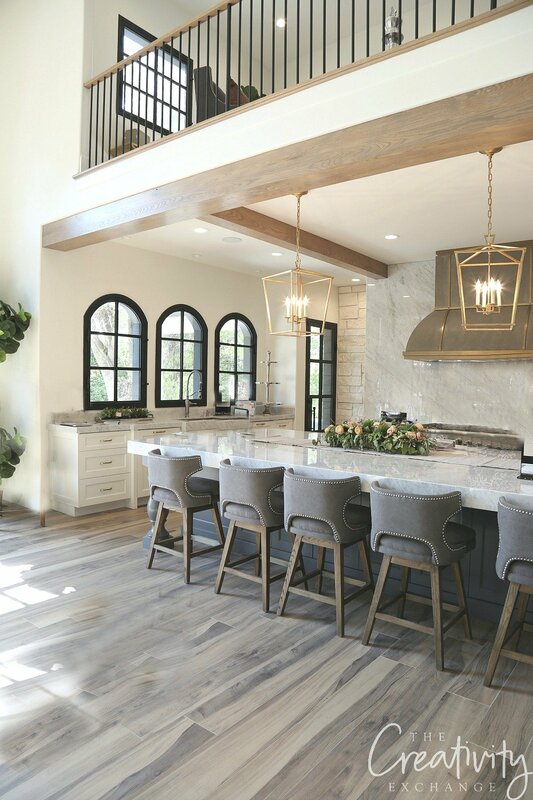 I saw a lot of combination open/closed shelving in many of the kitchens, which is one of the biggest trends right now, like this stunning kitchen in the Finsand Development home. I also saw lots of beautiful open concept homes and many of them had dramatic ceiling heights like this home from Tree Haven Homes. I have so much more to share with you guys and it will take me forever to upload all the pictures I took but as soon as pull everything together, I will highlight some of the homes, builders and designers. Stay tuned! Thanks so much for sharing the fun home tour!! 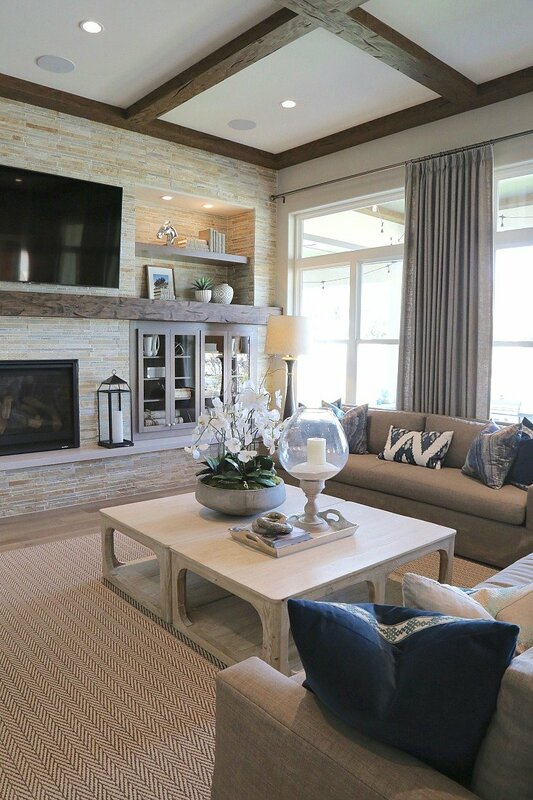 I love seeing the gorgeous new clean interiors! Your photography is beautiful too! Looking forward to seeing more in the future! Oh WOW!! Can’t wait to see more of your beautiful pictures! The houses look amazing! Thank you for sharing. This is really fun and amazing. Just loved the tour. Love the floors. Do you know what they are? Wondering what the floors are, too! Love this post. Thank you for sharing it. I wonder if you could also share some of the paint colours. 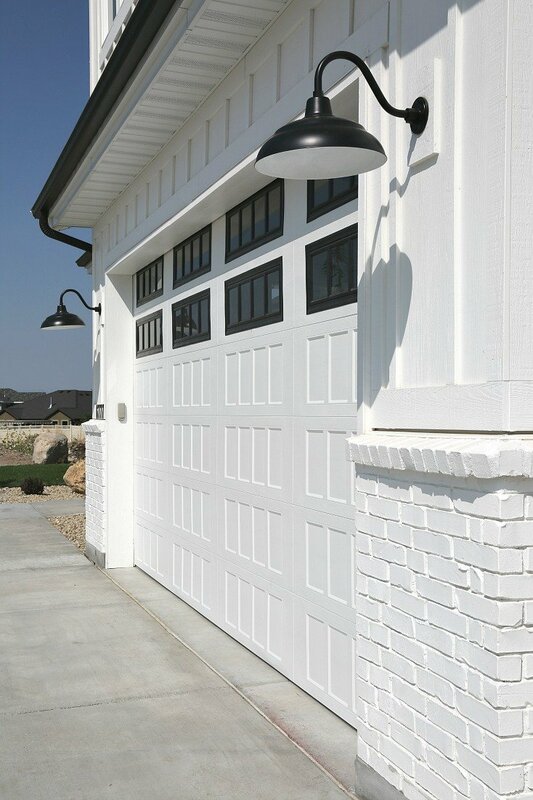 Particularly the exterior off white on number 23 by Magleby. Many thanks. Would love to know what exterior color you would suggest for my house on the lake in Georgia. It has so much going on with it architecturelly and I could use some help. I can’t wait for more interior photos. I love what you’ve shared so far. Thank you! 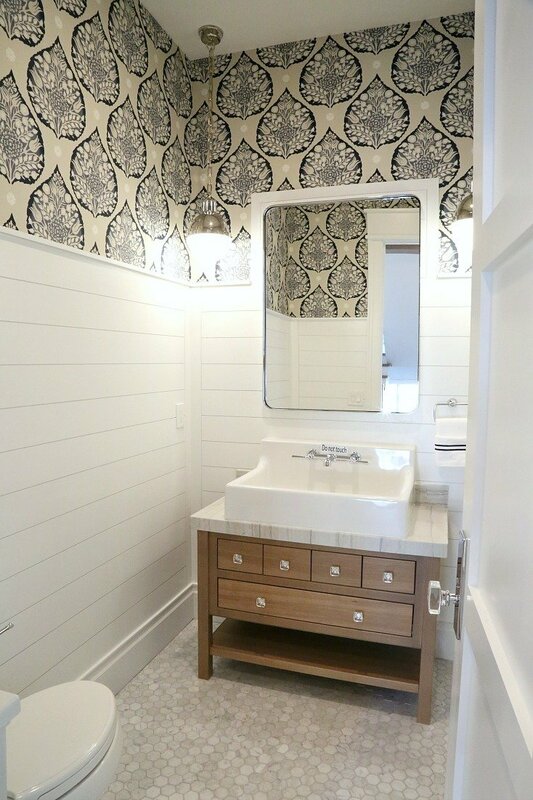 Any idea what the powder room wallpaper is? Cindy – enjoy your blogs . Great recap of the parades . 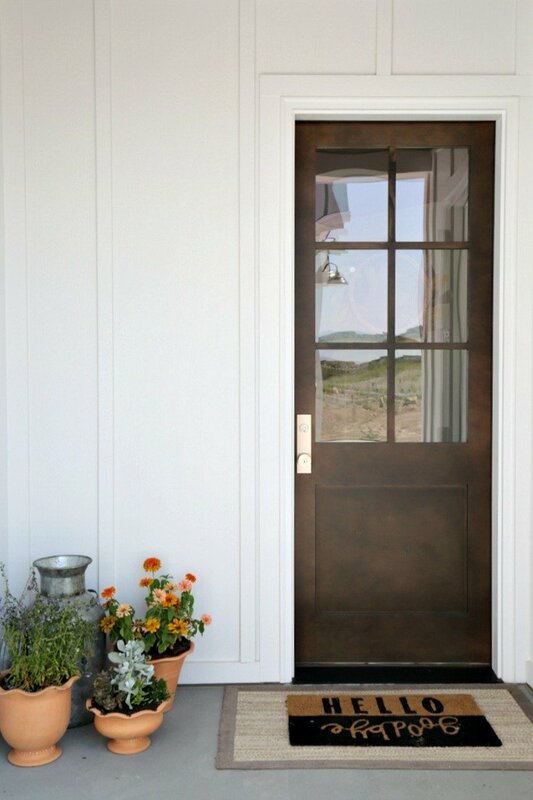 Also love when you do your paint color blogs . 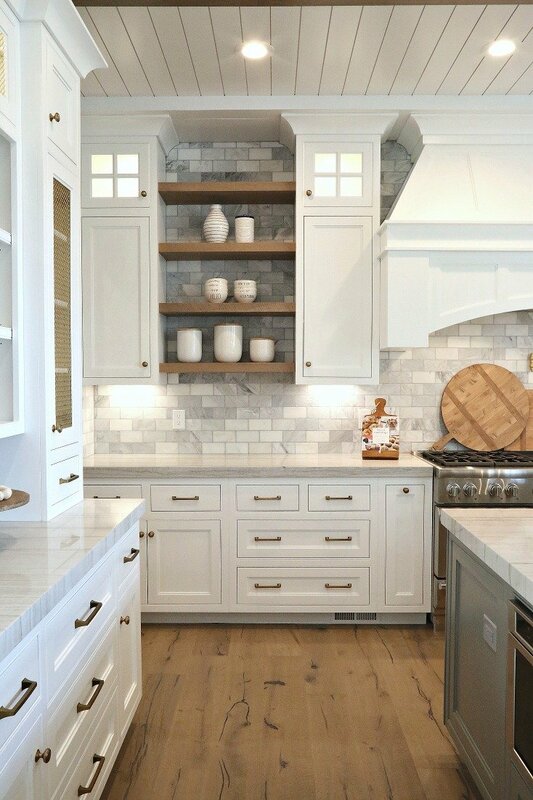 Would like info on the kitchen tile backsplash, the name / brand ?